Promotional art for the series. 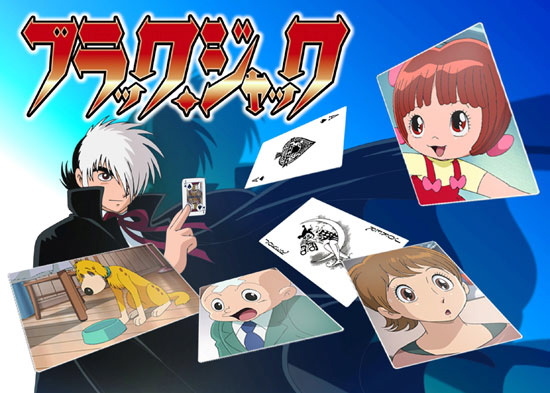 Black Jack (ブラック・ジャック) is a 78-episode adaptation of Osamu Tezuka's seminal manga series of the same name that was produced by Tezuka Production and aired on Animax and Yomiuri TV in Japan between October 2004 and September 2006. The series was officially released in North America through streaming platforms and a limited DVD run via the now-defunct Anime Sols crowdfunding platform solely with the Japanese audio track. Black Jack follows Black Jack an unregistered doctor who has a mysterious past. Black Jack and his assistant Pinoko deal with medical cases that are not well known and can often be dangerous. His knowledge of science can help him save any patient's life so long as they pay up. On January 2nd, 2007, an English dub began airing on Animax channels in South East Asia. The dub was recorded in Hong Kong and featured Russell Wait as the titular lead and Andrea Kwan as Pinoko. This dub also included the Black Jack 21 followup as well as the Black Jack Special: The 4 Miracles of Life TV specials. Information for the cast of the original dub is hard to come by. So far, only two people have been credited. As of the writing of this article, there are no known home video releases of this dub, nor have any clips surfaced online. In 2017, a separate English dub produced in Burnaby, Canada was released, making it highly unlikely the original dub will ever surface again. ↑ Black Jack TV Series in English Retrieved 30 Sept '17. ↑ Black Jack (TV) - Anime News Network Retrieved 30 Sept '17. ↑ Odds & Ends: Turning Mecard + Black Jack 2004 dubs, Beyblade Burst Evolution this fall Retrieved 30 Sept '17. ↑ Your Name. production staff create promo short for Canadian tourism Retrieved 30 Sept '17.